Columbus – A Columbus-area man with a history of faking work injuries to obtain narcotics was sentenced Wednesday to six months probation and ordered to pay the Ohio Bureau of Workers’ Compensation $620 for the cost of investigating him. Thomas Gallagher, 47, of Dublin, pleaded guilty Nov. 16 to one first-degree misdemeanor count of workers’ compensation fraud in the Franklin County Court of Common Pleas. Besides probation, he was fined $500, with $400 suspended as long as he makes restitution to BWC. Gallagher obtained medical treatment and narcotics on March 13 last year at a Columbus hospital after claiming he had been injured on the job while working for a local casket maker. He filed an injury report to BWC, but BWC rejected his claim after finding he hadn’t worked at the company since October 2014. BWC’s Special Investigations Department found Gallagher pulled a similar maneuver in 2012. Gallagher filed an injury report with BWC on Feb. 15 that year, claiming he had been injured in October 2011 while working for a Speedway station. 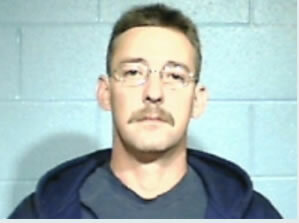 He received treatment and narcotics on Nov. 15 and Nov. 23, 2011, at a hospital in Dublin. BWC rejected the claim after Speedway reported Gallagher’s last day on the job was nearly a month prior to his alleged injury. 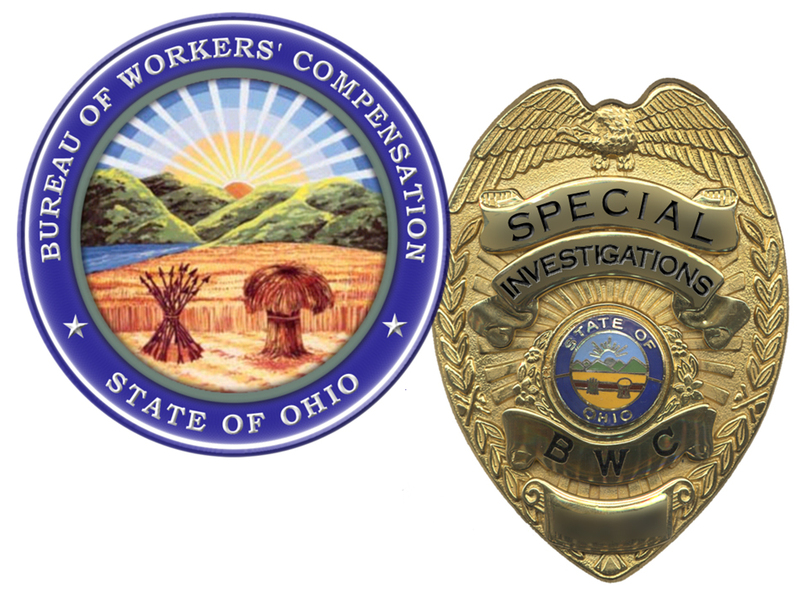 To report suspected cases of workers’ compensation fraud, call 1-800-644-6292 or visit bwc.ohio.gov. Normally, when our readers think of the words “BWC” and “certificate,” they think of the BWC Certificate of Coverage. This makes sense. The certificate is widely seen and easily recognized. It is the official document employers often frame to display within their business. Understandably, the law-abiding business owner wants every employee and customer to see that they have secured workers’ compensation coverage from our agency. They know that others see it as proof of the business’s legitimacy and a sign of the owner’s prudence. 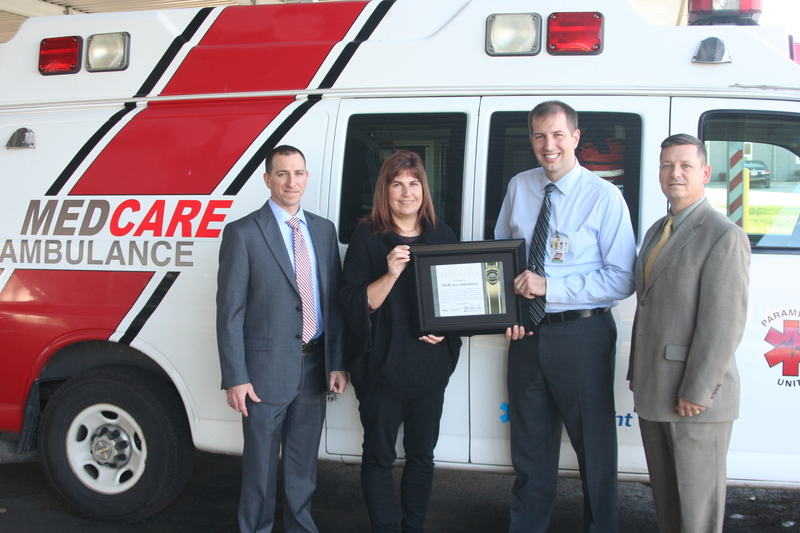 That might explain why Vice President of Operations Philip Koster and Human Resources Generalist Lisa Lucas with the Columbus-based business MedCare Ambulance were surprised when we contacted their organization asking to present them with another type of BWC certificate: a Certificate of Appreciation. Scott Lape, Special Agent in Charge of the Southeast Regional Claimant Special Investigations Unit (SIU) within the Special Investigations Department (SID), explained that the certificate acknowledges the business’s referral of a fraud allegation to BWC. The referral, submitted via an online fraud allegation form, had resulted in the successful prosecution of a subject, Lynn D. McCann, II (Knox County) on Sept. 6. 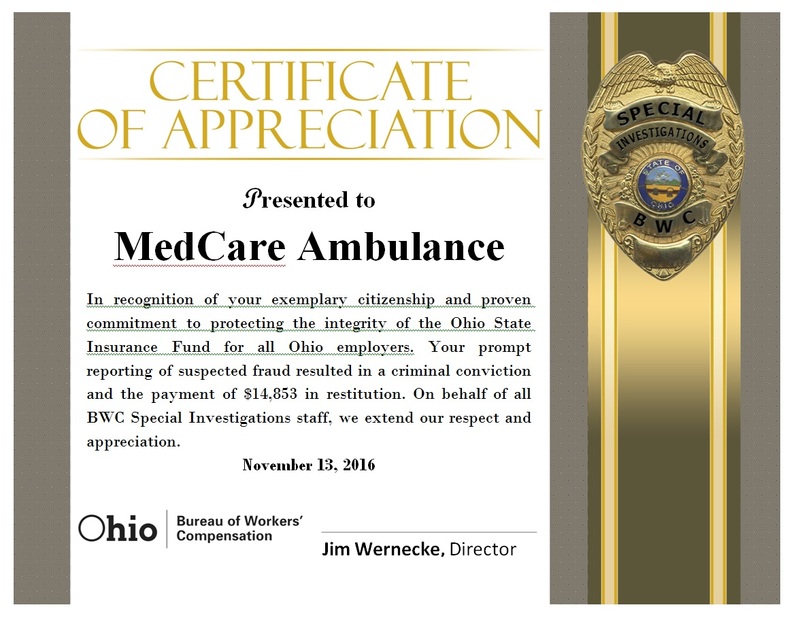 Signed by SID Director Jim Wernecke, the framed certificate is a simple way to demonstrate our thanks to MedCare Ambulance and others who are our partners in combating fraud. Significantly, Philip Koster and Lisa Lucas received the Certificate of Appreciation from Scott Lape and Columbus SIU Fraud Analyst John Koehl during International Fraud Awareness Week (IFAW) 2016. 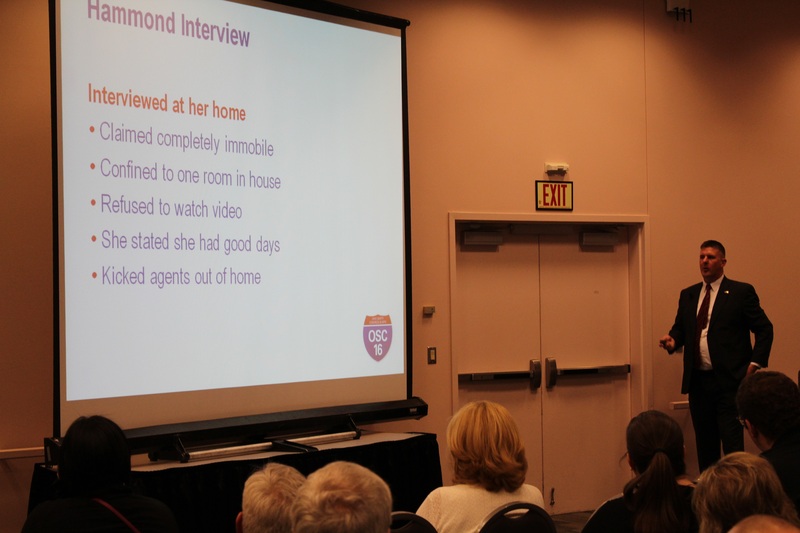 Sponsored annually by the Association of Certified Fraud Examiners, IFAW is dedicated to the prevention, identification and investigation of fraud – wherever it might occur throughout the world. Just like the talented and dedicated professionals with MedCare Ambulance, you are our eyes and ears in Ohio! Thank you for your help in stamping out fraud, and please, keep those tips coming. 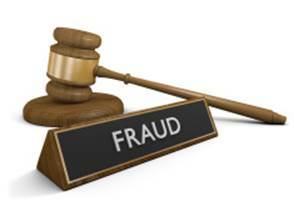 To report workers’ comp fraud to BWC, click here or call our fraud hotline at 1-800-644-6292. The owner of a Sandusky roofing company who pleaded guilty to workers’ compensation fraud in September must pay nearly $27,000 in restitution to the Ohio Bureau of Workers’ Compensation and serve five years probation, according to his sentence Nov. 9 in the Erie County Court of Common Pleas. A judge also warned Steve Petrick, Jr., that he would be jailed for six months if he fails to meet the terms of his probation. Besides monthly payments on his restitution, those terms call for Petrick to obtain and maintain full-time verifiable employment within 30 days of his sentencing. He also must obtain written permission from his probation officer before traveling out of state, and he can’t operate a motor vehicle prior to showing proof of a valid driver’s license and insurance to the Erie County Adult Probation Department. Petrick, owner/operator of Steve Petrick Roofing, caught the attention of BWC’s Special Investigations Department after an anonymous tipster alleged he was operating his business without the required coverage. BWC’s Employer Compliance Department attempted to assist Petrick with bringing his policy into compliance, but he claimed he had no employees and continued operating his business without coverage. The case was forwarded to BWC fraud investigators after an injury claim was filed against the policy while the policy was lapsed. The investigation and surveillance proved Petrick Roofing had been in continuous operation with employees. Petrick again failed to come into compliance following an interview with agents. Petrick pleaded guilty to a fifth-degree felony count of attempted workers’ compensation fraud Sept. 28. A former Campbell (Mahoning County) man who relocated to Florida was sentenced for fraud after he was discovered working while receiving workplace injury benefits, and using multiple aliases to cover his crime. Nikitas Xipolitas, 61, pleaded guilty to a fifth-degree felony count of workers’ compensation fraud on November 4. 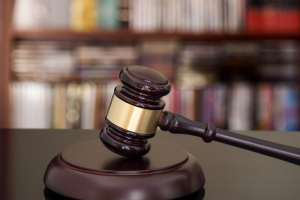 A judge in the Franklin County Court of Common Pleas sentenced him to six months of jail time, suspended for five years of community control, under the condition that he pay $23,601.48 in restitution the Ohio Bureau of Workers’ Compensation (BWC). Investigators with BWC’s Special Investigations Department (SID) began looking into Xipolitas in 2010 after receiving letters from several anonymous sources alleging that Xipolitas was working as a bridge painter for several companies. The letters advised that Xipolitas worked under alias names to avoid detection. The investigation confirmed that Xipolitas did work on highway bridge painting projects throughout the United States for several companies beginning in July 2010. He worked under four different alias names in attempts to conceal his work activity so that he could continue receiving benefits from BWC. A nurse who stole a dead patient’s electronic benefits card and a Southwest Ohio man who injured himself after using his employer’s tractor to go to a bar are among nine Ohioans convicted of workers’ compensation fraud in October, the Ohio Bureau of Workers’ Compensation (BWC) reported Wednesday. Toledo nurse Damita Frazier pleaded guilty Oct. 4 to petty theft, forgery and workers’ compensation fraud, all fifth-degree felonies, after BWC’s Special Investigations Department (SID) found she had taken a deceased patient’s BWC benefits card and used it to purchase household items and food. She also gave the card to her son, Shaquille Malone, who used it to purchase food, jewelry, auto parts and gas. Under a diversion agreement with the Lucas County Court of Common Pleas, Frazier must serve two years probation, provide 50 hours of community service and pay $2,122 in restitution to BWC. Malone pleaded guilty to a first-degree misdemeanor count of petty theft and agreed to pay $647 in restitution to BWC. He is scheduled to be sentenced on Dec. 13. In Brown County in Southwest Ohio, worker Chris Owen of Georgetown filed a claim for workers’ compensation after slipping and falling from a company tractor. Owen’s employer was suspicious and reported him to BWC. Investigators determined Owen used the tractor after work hours without the owner’s permission to travel to a local bar owned by his sister. The injury occurred when he returned the tractor to his employer. 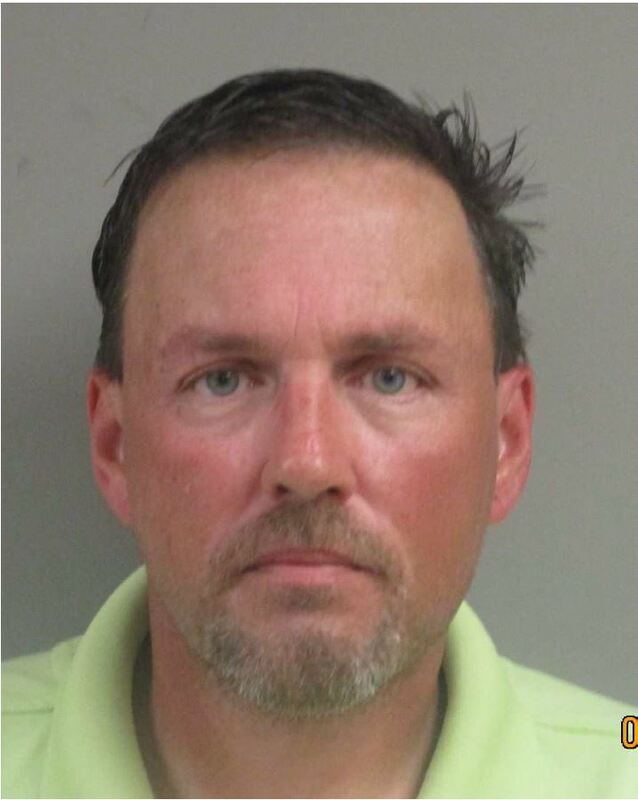 Owen pleaded no contest in Brown County Municipal Court and was found guilty of workers’ compensation fraud, a first-degree misdemeanor. A judge sentenced Owen to 180 days in jail, suspended, and one year of probation. He ordered Owen to pay BWC $2,366 in restitution. Kahsai pleaded no contest Oct. 17 and was found guilty of one count of failure to comply, a second-degree misdemeanor, after SID found she was operating her business with at least one employee and no workers’ compensation coverage. During the prosecution process, Kahsai submitted a BWC application for coverage and obtained valid coverage. A municipal court judge fined her $100. SID found a database cross match with the Ohio Department of Job & Family Services indicating Crenshaw earned wages while concurrently receiving BWC benefits. Agents found Crenshaw working as a home health aide while receiving temporary total disability benefits. Crenshaw pleaded guilty Oct. 6 to one count of workers’ compensation fraud, a first-degree misdemeanor. A county common pleas judge ordered Crenshaw to pay $10,000 restitution to BWC. That money was already on deposit with the clerk of courts at the time of sentencing. The defendant was sentenced to two days in jail, with two days of jail-time credit. Costs and fines were waived. George pleaded no contest Oct. 6 to one count of failure to comply, a second-degree misdemeanor, for operating his business without workers’ compensation coverage. George was ordered to pay $336 in restitution to BWC and $100 in court costs. White pleaded guilty Oct. 5 in Franklin County Common Pleas Court to one count of workers’ compensation fraud, a fifth-degree felony. Agents discovered White’s employer closed for business in 2013, but White filed false wage statements for nearly two years after that so he could qualify for more than $27,000 in wage-loss disability benefits. A judge found White guilty and sentenced him to community control for five years and ordered him to pay restitution of $25,000 to BWC. If White violates the terms of his community control, he must serve 12 months in prison. Smith pleaded guilty Oct. 4 to one count of workers’ compensation fraud, a first-degree misdemeanor, for claiming he had been injured on a job he had actually been fired from one day earlier. Smith received no benefits from the claim. A judge sentenced Smith to 17 days in jail and ordered him to pay $672 to BWC for its investigation. Smith had 17 days of jail-time credit and had already paid the $672 at the time of sentencing. Smith had previously been prosecuted for filing a false claim in 2010. Investigators found Speed had been operating his business under lapsed status since March 2003, with several injury claims filed during the lapsed period. Agents also found his wife, Anetta Speed, had opened another BWC policy for the business without disclosing the company had a previous policy. This was an attempt to avoid past experience and debt accrued by the business. Keith Speed was convicted Oct. 4 of one count of attempted workers’ compensation fraud, a first-degree misdemeanor. A judge sentenced him to one day in jail, with credit for time served.